Here is the list of the hotels near Croissy-Beaubourg. Book your hotel near Croissy-Beaubourg today, Thursday 09 May for the best price, reservation and cancellation free of charge thanks to our partner Booking.com, leader in on-line hotels reservation. Below here is the list the 50 closest hotels of Croissy-Beaubourg, sortable according your criteria. You will find the position of these accommodations on the Croissy-Beaubourg hotels map. This 3-star Campanile hotel is located in Torcy, just a 15-minute drive to Disneyland Resort Paris. It offers air conditioned guest rooms with free Wi-Fi access and free on-site private parking. Each of the modern rooms has tea and coffee making facilities and a flat-screen TV. All of the rooms have a private bathroom with a bath or shower. A buffet breakfast with fresh fruit is served daily and the Campanile Torcy Marne-La-Vallée also has a bar. Regional meals are served in the on-site restaurant. The Campanile Torcy Marne-La-Vallée is a 10-minute walk from Torcy RER station, which offers direct access to central Paris and Disneyland Resort Paris. Premiere Classe Marne la Vallée – Torcy is ideally placed at the A4 and A104 motorways junction and near the RER A station. It is a 17-minute drive from Disneyland Paris. The nearest TGV station is only 10 kilometres from the hotel and Roissy - Charles de Gaulle International Airport is just 20 minutes. The hotel features contemporary guest rooms fitted with en suite facilities, flat-screen TV and free Wi-Fi internet access. Bunk beds are available in some of the rooms for a third guest, with an extra cost. Enjoy a buffet breakfast served everyday in the dining area. Hotel Torcy Preferred hotel ! This Kyriad hotel is located opposite Torcy RER Station, which provides direct access to central Paris and Disneyland Paris. It is a 2-minute walk from Bay 2 Shopping Centre and offers rooms with satellite TV and free Wi-Fi access. Rooms at the Kyriad Marne-la-Vallée Torcy are also soundproofed and they include a TV with cable channels and tea and coffee making facilities. The en suite bathrooms are equipped with a bath and a hairdryer. A full breakfast buffet is served daily and the hotel’s restaurant, Karousel, offers traditional French cuisine. The Kyriad Torcy also provides a bar with a terrace for guests to relax in. The hotel offers free parking and is easily accessible from the E50/A4 motorways. It is a 15-minute drive from Disneyland Paris and a 45-minute drive from Park Asterix. 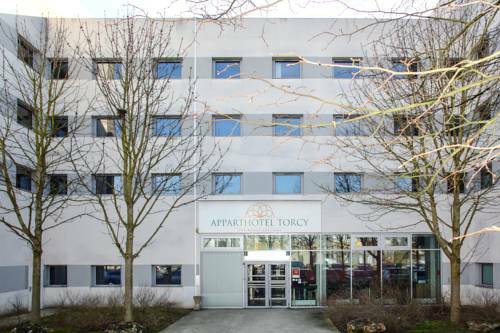 Apparthotel Torcy is located in the centre of Torcy and offers studios and one-bedroom apartments with free Wi-Fi access, a flat-screen TV and a private bathroom with shower. Guests can prepare their own homemade meal using the equipped kitchen on site. A buffet breakfast with French pastries, fruits and yogurts is prepared every morning. Paris - Charles de Gaulle Airport is located 20 km from the accommodation and Disneyland Paris can be reached in 10 minutes by train. The property offers free parking. HotelF1 Marne la Vallée Collégien offers accommodation in Collégien and is a 15-minute drive from Disneyland Paris. Rooms include a flat-screen TV. Each room comes with a shared bathroom and free WiFi. Guests can purchase microfibre towels at the hotel at an extra cost of EUR 3 each. A continental breakfast is served daily at an extra cost. Paris is 24 km from hotelF1 Marne la Vallée Collégien, while Marne-la-Vallée is 8 km from the property. The nearest airport is Paris - Charles de Gaulle Airport, 21 km from hotelF1 Marne la Vallée Collégien. Featuring free WiFi, B&B Hôtel Marne-La-Vallée Torcy allows easy access to Disney, just 3 stops away by RER train. It is situated in Torcy, 22 km from Paris. Private parking is available on site. Each room at this hotel is air conditioned and is fitted with a flat-screen TV. The rooms include a private bathroom equipped with a shower. A breakfast buffet complete with sweet and savory options, hot drinks and fruit juices, fresh bread and pastries, is served from Monday to Friday from 6:30 am to 10 am and from 7:30 to 10:30 on weekends and holidays. Pastries are baked on site every morning for breakfast. Marne-la-Vallée is 9 km from B&B Hôtel Marne-La-Vallée Torcy, while Versailles is 39 km away. The nearest airport is Paris - Charles de Gaulle Airport, 20 km from the property. Apartment Lognes Preferred hotel ! F2 Lognes bd du Segrais is situated in Lognes. This property offers access to a balcony. This apartment comes with a kitchen, a seating area, and a flat-screen TV. Paris is 25 km from the apartment, while Marne-la-Vallée is 13 km away. The nearest airport is Paris - Orly Airport, 31 km from F2 Lognes bd du Segrais. Hotel Collégien Preferred hotel ! This 4-star hotel is just 17 km from Disneyland Resort® Paris and only 30 km from Roissy Charles de Gaulle Airport. It features a fitness centre and a seasonal outdoor swimming pool. Val d'Europe Shopping Centre is 10 km away. The air-conditioned guest rooms include free Wi-Fi access, a safety deposit box and a 48-inch flat-screen TV. Each room has a private bathroom with a bath or shower. A bottle of water and a courtesy tray are also provided for your convenience. The hotel restaurant, Novotel Café, invites you to the pleasant dining area or the terrace by the outdoor swimming pool. An à la carte service is offered every day. You can also relax at the bar at Novotel Marne La Vallée Collégien, which serves a variety of drinks and cocktails. The hotel also has a free secure outdoor car park. Other facilities includes a children's playground, 2 game consoles and an internet corner. This 3-star hotel is a 5-minute walk from Torcy RER Station, which leads directly to Disneyland® Paris in 3 stops. Private parking is free on site at the hotel. A TV with satellite channels is offered in all of the rooms at Hotel The Originals Torcy Codalysa (ex Inter-Hotel). Each room features a small private bathroom with a shower. All have access to the hotel’s WiFi connection and ironing facilities are available upon request. French pastries and seasonal fruit are featured on the buffet breakfast at Hotel The Originals Torcy Codalysa. Additional hotel facilities include vending machines and a lift that serves all of the rooms. Alcoholic and non-alcoholic beverages can be purchased at the hotel's reception. Hotel The Originals Torcy Codalysa is located in a leisure and shopping park with over 110 shops. Guests can buy cinema movie tickets at a reduced price directly from the hotel's front desk. Paris city centre can be accessed directly using the local RER train network. Residence Le Roi du Lac offers accommodation in Lognes, 22 km from Paris and 10 km from Marne-la-Vallée. Residence Le Roi du Lac boasts views of the lake and is 38 km from Versailles. A flat-screen TV is available. A microwave and a kettle will be at guests' disposal. Villepinte is 16 km from Residence Le Roi du Lac, while Fontainebleau is 49 km away. The area is popular for cycling and hiking. The nearest airport is Paris - Charles de Gaulle Airport, 19 km from the property. F2 Lognes 63 rue Tour d'Auvergne is set in Lognes. With lake views, this accommodation features a balcony. This apartment is equipped with 1 bedroom, a TV, and a kitchenette. Paris is 26 km from the apartment. The nearest airport is Paris - Orly Airport, 32 km from the property. Located in Bussy-Saint-Martin, La Villa Blanche provides B&B accommodation, just 100 metres from the Park of Rentilly. Just 15 minutes' drive from Disneyland Paris, you can relax on the furnished terrace, by the garden. The room at La Villa Blanche is elegantly decorated in cream tones. It features an independent entrance, an electric kettle and a private bathroom with a shower. A continental breakfast is included and served daily in the dining room or on the terrace, during summer months. Free Wi-Fi is provided throughout the B&B. Free private parking is also possible on site and Charles de Gaulle Airport is 20 km from La Villa Blanche. Situated in Lognes in the Ile de France region, Residences les roseaux has a balcony. Featuring garden and city views, this apartment also offers free WiFi. Composed of 1 bedroom and 1 bathroom with a bath, this apartment has a cable flat-screen TV. The accommodation is equipped with a kitchen. Guests can also relax in the garden. Paris is 26 km from the apartment, while Marne-la-Vallée is 14 km from the property. The nearest airport is Paris - Orly Airport, 32 km from the property. Hôtel balladins Torcy - Marne-La-Vallée offers soundproofed rooms with free WiFi internet access and TVs with satellite channels.The reception is open 24/7. It is located in the centre of Torcy, a 15-minute drive from Disneyland® Paris. At Hôtel balladins Torcy - Marne-La-Vallée, guests can enjoy a daily buffet breakfast. It is a 20-minute drive from Paris and 1.7 km from the Torcy RER A train station, which gives direct access to central Paris and Disneyland® Paris. For guests coming by car, Hôtel balladins Torcy - Marne-La-Vallée provides free private parking. The Premiere Classe Marne La Vallee is 10 minutes from the Disneyland Resort Paris. It boasts well-equipped, modern rooms with free Wi-Fi internet access, all serviced by a lift. Paid private parking is also provided. The Premiere Classe is easily accessible via the motorway and there is a bus stop in front of the hotel that can take you to the RER train station at Torcy, where you can catch the train to Disneyland. Each morning guests can enjoy an all-you-can-eat breakfast. Premiere Classe Marne La Vallee St Thibault Des Vignes has a 24-hour reception and parking. It is is only 20 minutes from central Paris, 30 minutes from the Astérix theme park and half an hour from the Roissy Charles De Gaulle Airport. Located in Bussy-Saint-Georges, this hotel is just a 10-minute walk from Bussy-Saint-Georges RER Station and a 12-minute drive from Disneyland Paris. With a 24-hour reception, it offers a garden and soundproofed accommodations, equipped with free Wi-Fi. All of the rooms at B&B Hôtel Marne la Vallée feature a satellite TV, a desk and a garden view. Each room also includes a private bathroom with a shower. A buffet breakfast is served every day from 06:00 to 10:00 during the week and from 06:30 to 10:30 at weekends, in the communal lounge. Free private parking is possible on site. Guests can purchase Disneyland tickets directly at the hotel. Paris is 30 km from the hotel and it can easily be reached with RER Line A.
Hipotel Marne La Vallée is situated opposite the RER A station in Noisiel, just 12 km from Disneyland Paris. It offers free public parking and free low-speed WiFi internet access. Rooms at the Hipotel have direct-line telephone, cable TV and a private bathroom. A buffet breakfast is served every morning in the Hipotel’s dining area. Hipotel Marne La Vallée is just 10 minutes from Val d’Europe factory outlet mall and just a short drive or train ride to the centre of Paris. Situated in Bussy-Saint-Georges in the Ile de France region, Jardins Célestes has a balcony and city views. Guests staying at this apartment have access to free WiFi and a fully equipped kitchen. The apartment comes with a flat-screen TV and a living room. An American breakfast can be enjoyed at the property. Paris is 30 km from the apartment, while Marne-la-Vallée is 7 km from the property. The nearest airport is Paris - Orly Airport, 36 km from Jardins Célestes. Appartement proche de Disneyland offers apartment accommodation in Bussy-Saint-Georges, 11 km from Disneyland Paris and Marne-la-Vallée. Featuring free WiFi, the apartment is a 1-minute walk from Bussy-Saint-Georges RER Train Station which provides direct access to Paris and Disneyland Paris. The living room features a flat-screen TV and a dining area. The open-plan kitchen is fitted with a refrigerator, a microwave and a stove. A bakery is available in the area. A continental breakfast is at guests' disposal every morning. A supermarket and a bakery can be found in the surroundings. The apartment is 52 km from Versailles and 26 km from Paris. The nearest airport is Paris - Charles de Gaulle Airport, 30 km away. Private, secured parking is available at an extra cost subject to availability. Set in Noisiel, 350 meters from Menier chocolate factory, Chambres dans Quartier Historique offers accommodation with a private entrance and a garden. Free WiFi access is provided. The suite offers 2 bedrooms with a private bathroom and an en suite toilet. Each room is equipped with a flat-screen TV. Paris is 28 km from Chambres dans Quartier Historique, while Disneyland Paris is 24 km away. Free private parking is possible on site. Apartment Bussy-Saint-Georges Preferred hotel ! Family Travel Paris is set in Bussy-Saint-Georges. This apartment provides a terrace as well as free WiFi. The apartment includes a kitchen with a dishwasher and an oven, as well as a coffee machine. A flat-screen TV and DVD player are offered. Paris is 30 km from the apartment, while Marne-la-Vallée is 7 km from the property. Paris - Orly Airport is 36 km away. Located in Saint-Thibault-des-Vignes, just a 15-minute drive from Disneyland Paris, ibis budget Marne la Vallée offers a 24-hour reception and garden. Villepint Exhibition Centre is 20 km away. All rooms feature a flat-screen TV, desk and heating. The en suite bathroom is complete with free toiletries. A breakfast is available each morning at ibis budget Marne la Vallée. Guests can find restaurants in Lagny-sur-Marne, a 5-minute drive away. The centre of Paris is just a 30-minute drive from the hotel and the A104 motorway is ideally located 900 metres away. Additional features include a terrace, luggage storage and rooms adapted to guests with reduced mobility. Hotel Bussy-Saint-Georges Preferred hotel ! Hôtel Mercure Marne la Vallée is opposite the Bussy Saint Georges RER train station, which leads directly to Disneyland Paris and Val d'Europe shopping centre. Decorated in a contemporary style, the en suite rooms at Hôtel Mercure Marne la Vallée are air-conditioned and include a flat-screen TV and free Wi-Fi. Family rooms and rooms with access for people with reduced mobility are available. The restaurant serves traditional French Provençal cuisine and olive-oil themed dishes. Daily set menus, à la carte choices and children’s meals are available. A breakfast is also served every day. Guests can enjoy a refreshing cocktail in the Café du Monde, a pleasant lounge with TV, billiards table and piano music. A fitness centre with complimentary access for all guests is also available. Bel Apparte Disneyland Paris is located in Bussy-Saint-Georges and offers a terrace. This apartment features accommodation with free WiFi. The apartment includes 3 bedrooms and a kitchen with a dishwasher and an oven. The apartment also provides a seating area and 1 bathroom with a bath. Paris is 30 km from the apartment. Paris - Orly Airport is 36 km from the property. Situated in Bussy-Saint-Georges in the Ile de France region, Appartement Bussy Disneyland has a balcony. Guests staying at this apartment have access to free WiFi. The apartment includes 2 bedrooms and a kitchen with a dishwasher and an oven. A flat-screen TV with satellite channels is featured. Paris is 31 km from the apartment. The nearest airport is Paris - Orly Airport, 36 km from the property. 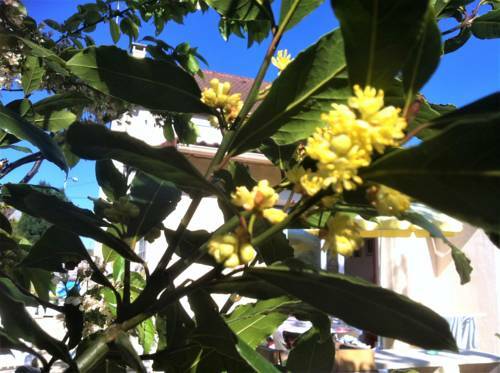 Featuring accommodation with a balcony, Couleurs Vacances is located in Bussy-Saint-Georges. The accommodation has free WiFi. The property includes a living room with a flat-screen TV. There is a seating area, a dining area and a kitchen complete with an oven, a microwave and a toaster. Paris is 30 km from the apartment. The nearest airport is Paris - Orly Airport, 36 km from the property. Located in Bussy-Saint-Georges in the Ile de France region, L Escale Parisienne De Valerie features a garden. This property offers access to tennis at the tennis court and free WiFi. The apartment includes a living room with a TV and a DVD player. A dishwasher, a microwave and a fridge can be found in the kitchen. Paris is 31 km from the apartment, while Marne-la-Vallée is 6 km from the property. Paris - Orly Airport is 36 km away. Featuring barbecue facilities and a garden, Joumana tourisme features accommodation in Gouvernes with free WiFi and garden views. Guests staying at this villa have access to a fully equipped kitchen. Leading onto a terrace, this villa comes with 2 separate bedrooms. The villa also provides a flat-screen TV, a seating area, washing machine and 1 bathroom with a shower. The villa offers a children's playground. Paris is 32 km from Joumana tourisme, while Marne-la-Vallée is 9 km away. The nearest airport is Paris - Charles de Gaulle Airport, 33 km from the accommodation. Boasting accommodation with a terrace, Appartement proche Disney is located in Bussy-Saint-Georges. Guests staying at this apartment have access to a balcony. The apartment includes 1 bedroom and a kitchen with a microwave and a kettle. The apartment also includes a seating area and 1 bathroom. If you would like to discover the area, hiking is possible in the surroundings. Paris is 31 km from the apartment, while Marne-la-Vallée is 6 km away. Paris - Orly Airport is 37 km from the property. Offering free WiFi and garden views, Studio Chez TEVY is an accommodation situated in Pontault-Combault. The accommodation is 29 km from Paris. The apartment has 1 bedroom, a flat-screen TV with satellite channels and a fully equipped kitchen that provides guests with an oven and a microwave. The accommodation also offers 1 bathroom with a shower and a washing machine. The apartment offers a barbecue. The property has a garden and sun terrace, which guests can enjoy if the weather permits. Marne-la-Vallée is 20 km from Studio Chez TEVY, while Versailles is 42 km away. The nearest airport is Paris - Orly Airport, 25 km from the accommodation. Guest accommodation Pontault-Combault Preferred hotel ! Featuring a garden, Maison Chez Tevy offers accommodation in Pontault-Combault with free WiFi and garden views. The accommodation is 23 km from Paris. The holiday home consists of 2 separate bedrooms, 1 bathroom with free toiletries, and a seating area. There is a dining area and a kitchen complete with an oven and a microwave. The holiday home offers a terrace. Marne-la-Vallée is 21 km from Maison Chez Tevy, while Versailles is 42 km away. The nearest airport is Paris - Orly Airport, 25 km from the accommodation. Located in Bussy-Saint-Georges in the Ile de France region, DISNEYLAND-PARIS aux portes de la Batcave has a terrace. The accommodation is 32 km from Paris and 1 km from Bussy-Saint-Georges RER Station. The apartment includes a kitchen with a dishwasher and a microwave, as well as a coffee machine. A flat-screen TV with cable channels is offered. If you would like to discover the area, hiking is possible in the surroundings. Marne-la-Vallée is 16 km from the apartment, while Versailles is 58 km from the property. Paris - Charles de Gaulle Airport is 33 km away. Bed and Breakfast Conches Preferred hotel ! Situated in Conches-sur-Gondoire, LES CHAMBRES D'ALINE offers barbecue facilities. All rooms boast a flat-screen TV with cable channels and a private bathroom. Every room is fitted with a terrace with views of the garden. At the bed and breakfast, every room has a wardrobe. LES CHAMBRES D'ALINE offers a continental or à la carte breakfast. The accommodation offers a children's playground. Paris is 27 km from LES CHAMBRES D'ALINE, while Marne-la-Vallée is 5 km from the property. The nearest airport is Paris - Charles de Gaulle Airport, 20 km from the property. Set in Bussy-Saint-Georges, Dream House Rooms & Apartments offers accommodation with free WiFi. Some units also have a kitchenette equipped with a dishwasher, an oven, and a microwave. The apartment offers a terrace. Guests can relax in the garden at the property. Paris is 32 km from Dream House Rooms & Apartments. The nearest airport is Paris - Charles de Gaulle Airport, 37 km from the property. The ibis Marne La Vallée Hotel is located in Champs-sur-Marne, close to the Disneyland Resort Paris theme park and only 25 km from Orly and Roissy Charles de Gaulle airports. This ibis hotel offers air-conditioned rooms equipped with a television and radio. Each guest room features a private bathroom. Free WiFii connection is available. A buffet breakfast composed of sweet and savoury dishes such as eggs, fruit salad, yogurts and juices is served every day. Pastries baked on site and fresh French Madeleine cakes are also on offer, as well as a hot beverage and a piece of fruit to take away. Outside of regular breakfast hours guests can also enjoy a lighter option, available from 04:00. The hotel features a cafe-restaurant, serving regional produce. Guests can dine on the terrace. The hotel bar is open 24 hours a day. With indoor parking, the hotel is near Noisy Champs train station and can be reached by the RER A train. Paris is only a 10-minute journey away. Bed and Breakfast Bussy-Saint-Georges Preferred hotel ! Located 7 km from Disneyland Paris and 4 km from Val d’Europe shopping centre, Maison Tobias features a garden, a terrace and free Wi-Fi throughout. The room has a seating area with sofa, a terrace and individual heating. The private bathroom includes with free toiletries and a hairdryer. A continental breakfast and a brunch can be served daily. Charles de Gaulle Airport is 15 km from Maison Tobias. With free private parking possible on site, and Marne-la-Vallée - Chessy RER station only 7 km away, the B&B offers easy access to Paris. Guest accommodation Brou-sur-Chantereine Preferred hotel ! Relais de Chelles offers barbecue facilities and a sauna, as well as accommodation with a kitchen in Brou-sur-Chantereine. The aparthotel offers a seating area with a flat-screen TV and a private bathroom with free toiletries and shower. An oven and microwave are also available, as well as a coffee machine and a kettle. Relais de Chelles offers a terrace. Guests can also relax in the garden or on the shared lounge area. Paris is 25 km from the accommodation, while Marne-la-Vallée is 16 km from the property. Paris - Charles de Gaulle Airport is 28 km away. Set in Chelles, Ravinala features accommodation with a terrace and free WiFi. Guests staying at this holiday home have access to a fully equipped kitchen. The holiday home features a TV. The holiday home offers a barbecue. Guests can also relax in the garden. Paris is 25 km from Ravinala Vaires Sur Marne, while Marne-la-Vallée is 15 km away. The nearest airport is Paris - Charles de Gaulle Airport, 26 km from the property. Gul nacira is situated in Chanteloup-en-Brie, 9 km from Disneyland Paris, 28 km from Paris and 3 km from Marne-la-Vallée. Free private parking is available on site. Versailles is 45 km from Gul nacira, while Villepinte is 19 km from the property. The nearest airport is Paris - Charles de Gaulle Airport, 21 km from Gul nacira. Located just a 15-minute journey by public transport from Disneyland Paris and the centre of Paris, GreenHill offers B&B accommodation with a garden and shared TV lounge. A free shuttle service is possible from the property to Noisy-le-Grand RER station. All rooms feature a wardrobe, wooden flooring and heating. Some have shared bathroom and toilet facilities, while others have a private bathroom with a hairdryer. Guests can find a large choice of restaurants in the centre of Paris. Orly Airport is ideally located 29 km from the property and the Paris Périphérique motorway is a 15-minute drive away. Free Wi-Fi access is provided throughout and free private parking is possible on site. Hotel Chanteloup-en-Brie Preferred hotel ! Located only a 14-minute drive from Disneyland Paris and a 40-minute drive from the Astérix Amusement Park, Best Western Hôtel Grand Parc Marne La Vallée features a spa with a sauna and hot tub, available at a surcharge. Guestrooms at Best Western Hôtel are air-conditioned and soundproofed. Room facilities include satellite TV and a private bathroom with a bath and a hairdryer. The Best Western Hôtel features a bar and snacks are provided upon request. A buffet breakfast is served daily and includes hot drinks, pastries and yoghourt. Guests can relax in the hotel garden. Paris is a 30-minute drive from the hotel and free parking is available onsite. This Campanile hotel is set 1.8 km from the Chelles-Gournay Train Station and provides modern accommodation just 20 kilometres east of Paris. Rooms at the Campanile Chelles are equipped with en suite facilities. They present modern and well-appointed living spaces and include free Wi-Fi access. The food on offer ranges from traditional regional fare to light or homey cuisine. Guests can choose from the buffets or menus, and there is even a children’s menu. The City Résidence Chelles is only a short walk from the banks of the River Marne, just a 20-minute drive from Disneyland Paris. It offers studio to 2-room apartments for 1 to 4 guests. Studios and apartments have a flat-screen TV with satellite channels, kitchenette, coffee/tea making facilities and a private bathroom. All units are serviced by a lift. Weekly cleaning service is included in the price. The RER station Chelles-Gournay is a 15-minute walk from the City Résidence Chelles. From there you can reach Paris Saint-Lazare station in 30 minutes. There is a private parking on site. Below here is the hotels map of Croissy-Beaubourg. Names and details of Croissy-Beaubourg hotels can be shown on the map clicking on the prices icons.